We have gained a remarkable position in the relevant industry by offering distinguished assortment of Gerberas Flower that is widely used in flower arrangements and bouquets. The offered flower is cultivated by using premium quality seeds and innovative technology by our vendors' experts. 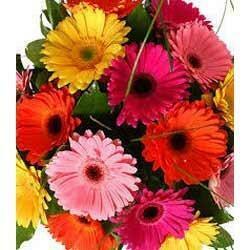 To ensure its quality, this flower is tested against various parameters. Clients can avail this flower from us at affordable prices. J. International Exports & Imports was established in the year 2014. we are the leading Exporter and Importer of Fruits & Vegetable etc. We are one-step ahead of our competitors in manufacturing & supplying a wide range of Areca Disposable Cups. Owing to its elegant designs and artistic style, these cups are extensively demanded by various clients. Our cups are known for its cost effective nature. Apart from this, we offer these cups at affordable rates.With gained expertise in the area, we are offering an exclusive of Crystal Quality Disposable Cup. Due to high demand by clients, we provide this product in diverse patterns. In addition, this product is made employing the finest quality material and advanced techniques. In addition, we provide this product at nominal prices. Our firm specializes in providing a quality array of Disposable Cup that is available in various colors and sizes. It is used in parties for serving tea and coffee and is crafted by our seasoned craftsmen using superior quality raw material keeping in mind the latest market trends. Our offered product is highly appreciated by our clients for its features like impeccable finish and light weight.